Donq quai has been used in traditional Chinese medicine for more than 2,000 years. Its functions include strengthening the heart, kidneys, liver, lung, and spleen; it also serves as a blood tonic by promoting proper blood circulation. Literally meaning “proper order”, dong quai, most especially its dried roots, is said to contribute to the general well-being of those who ingest it. Dong quai has proven its worth as a relaxant. Its effects can bring about the dilation of the blood vessels. This makes it easier for blood to flow and move throughout the body, which consequently reduces pain, and relaxes the uterine muscles, contributing to better urine flow. When used with ginseng (Asian ginseng) and astragalus (Astragalus membranaceus), dong quai alleviates the symptoms of chest pain. Dong quai has sedative, analgesic, anti-inflammatory, and antispasmodic properties. Dong quai is chock-full of antioxidants that neutralize harmful free radicals that damage otherwise healthy cells, arming the body with enough antibodies to stave off diseases and fight infection. Dong quai is good for the cardiovascular system. It can be ingested to correct abnormal heart rhythm or arrhythmia and inhibit the accumulation of the platelets in the blood vessels, which can result in plaque formation or atherosclerosis. It lowers blood pressure. It is found to increase tolerance for exercise among people with heart conditions and prevent brain damage in people who just suffered from a stroke. Dong quai is good for the excretory system. It provides for the proper production of urine and serves its function as a mild laxative. Dong quai is good for the digestive system. It can guard against the risk of ulcer. Dong quai is good for the female reproductive system. 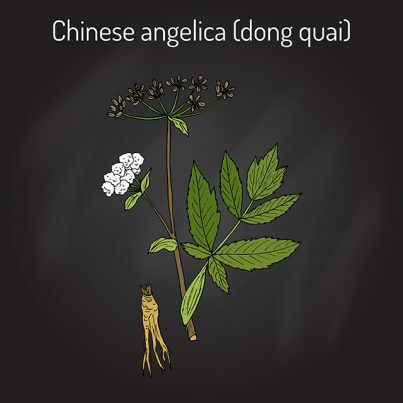 It can be used to treat symptoms of premenstrual syndrome, along with other Chinese herbs such as black cohosh. It regulates estrogen levels in a woman’s body. It can also address abnormalities within the menstrual cycle, such as painful menses and uterine bleeding and alleviate menopausal symptoms such as hot flashes, mood swings, and night sweats. Dong quai is good for the immune system. It stimulates white blood cell production, thus optimizing the liver’s function of eradicating toxins from the body. This activity is good for cancer prevention. Dong quai is usually taken as a tea or a tincture. Pregnant women should not use dong quai because it might interfere with the function of the uterus muscles; even menstruating women are cautioned against it, because it induces a kind of bleeding so heavy that it might reproductive problems. Parents should not let children ingest dong quai, for experts have yet to decide on the appropriate dose of dong quai for children. As such, lactating mothers are warned against ingesting it, for there is no known literature on the effects of the breast milk tinged with dong quai on the infant. It should also not be taken by people who are suffering from chronic diarrhea or bloating. Dong quai increases sensitivity to sunlight. People who take it without using proper sunscreen or continue their exposure to sunlight may experience having rashes and skin inflammation. It should not be taken with St. John’s wort, which has the same side effect. People who are using blood thinning agents or hormone medications such as progesterones, oral contraceptives, estrogens, tamoxifen or raloxifene, are also cautioned against it. Dong quai is good for the digestive, the female reproductive, and the immune systems. Dong quai is chock full of antioxidants that neutralize harmful free radicals that damage otherwsie healthy cells.